President Viktor Yanukovych, government officials and relatives of the victims laid flowers at the monument to those killed by the Nazis in the Babi Yar ravine in the Ukrainian capital, Kiev. More than 33,700 Jews were shot in Babi Yar over the course of two days, beginning Sept. 29, 1941, one of the most horrific killings of the Holocaust. In the ensuing months, the ravine was filled with some 100,000 bodies, including those of non-Jewish Kiev residents and Red Army prisoners of the Nazis. 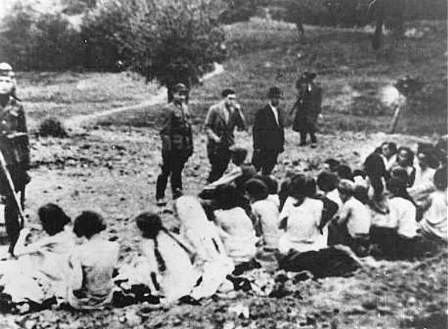 Mass executions at Babi Yar continued up until the German forces departed from Kiev. On January 10, 1942 about 100 sailors from a military flotilla were executed there. In addition, Babi Yar became a place of execution of residents of five Gypsy camps. According to various estimates, during 1941—1943 between 70,000- 200,000 Roma people were rounded up and murdered at Babi Yar. Patients of the Ivan Pavlov Psychiatric Hospital were gassed and then dumped into the ravine. Thousands of other Ukrainians were killed at Babi Yar. Among those murdered were 621 members of the Organization of Ukrainian Nationalists (OUN). Ukrainian poet and activist Olena Teliha and her husband, renowned bandurist Mykhailo Teliha, were murdered there on February 21, 1942. In the two years that followed, Russians, Ukrainians, Gypsies, and people of all nationalities were murdered in Babyn Yar. The belief that Babyn Yar is an exclusively Jewish grave is wrong… It is an international grave. Nobody will ever determine how many and what nationalities are buried there, because 90% of the corpses were burned, their ashes scattered in ravines and fields. So let us not forget the victims of Babi Yar, as many of them were Ukrainians as well. Anyone notice this on The Simpsons last night? Vegreville Pysanky Festival this weekend! None of this is any worse than the firebombing of Dresden, done just to show them squareheads who’s boss.